There are currently no “ideal” options for cleaning up an oil spill. Chemical dispersants, such as the COREXIT 9500A used after the Deepwater Horizon event in 2010, contain ingredients whose long-term effects on the environment and on marine life are unclear or unknown. The decision to use them is a controversial one: breaking spills into small droplets using even more things that shouldn’t be in the ocean is problematic, but surface slicks and oil washing up on shores is probably worse. Members of the Complex Fluids and Nanomaterials Group at the University of Maryland are conducting fundamental research on nontoxic materials that may one day be used to create safer dispersants. 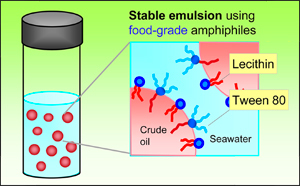 Recent results published in Langmuir describe a new food-grade emulsifier that creates smaller droplets of crude oil in seawater and keeps them apart longer than COREXIT 9500A. The ongoing project is funded by the Gulf of Mexico Research Initiative (GoMRI). In theory, this should make it easier for ocean dwelling, oil-consuming bacteria to remove spilled oil. But far below the waves, fish and crustaceans–including those we eat–will absorb or consume the droplets too. It is for that reason that Department of Chemical and Biomolecular Engineering professor Srinivasa Raghavan, the director of the Complex Fluids and Nanomaterials Group, has partnered with Professor Vijay John and his research group at Tulane University to explore whether each component of an oil dispersant can be made from nontoxic, biodegradable materials while offering performance equal to or better than commercial products. It won’t change the oil in any way, but it would make using dispersants a little safer. The team combined two surfactants to create a new emulsifier that is effective on mixtures of crude oil and seawater. One of these materials is lecithin, a natural phospholipid (a type of fat) found in soybeans, certain seeds, and eggs. The other is a polysorbate (a combination of natural sugar alcohol and fatty acids) called Tween 80®, which makes products like ice cream smoother. Both are amphiphiles, meaning their molecules are attracted to water on one end and fats and oils on the other. While neither is an effective emulsifier on its own, they make a great team in a 60/40 lechithin/Tween 80 blend. When exposed to a mixture of seawater and crude oil, lecithin’s and Tween 80’s amphiphilic (“fat-loving”) ends attach themselves to the oil. As these connections are made, the oil is broken into droplets coated with a thin film of densely packed surfactant molecules whose hydrophillic (“water-loving”) ends face the seawater. The lecithin maintains a particularly strong grip on the oil, while the Tween 80’s large hydrophilic ends block the droplets’ ability to merge with each other or back into the slick. A comparison of the new lecithin/Tween 80 blend with the Corexit 9500A used in the Gulf of Mexico spill shows that the former leads to smaller oil droplets that remain stable and prevent coalescence for a much longer period of time. The size and stability of crude oil droplets are believed to be important to their dispersion and eventual degradation in the ocean, a process that could take years. Athas stresses that the current work is a proof of concept, the first step in designing a new dispersant. In the next phase of the research, the group will explore replacing another key ingredient, the solvent, which is the liquid medium that holds the emulsifier so that it can be sprayed as evenly as possible over an oil spill. “Ideally, we want a nontoxic solvent that's able to deliver the surfactants to the oil with very little mixing energy, since we can’t predict how strong the waves will be,” she says.